"Decemberists" redirects here. For the 1825 Russian uprising, see Decembrist revolt. For the unfinished Tolstoy novel, see The Decembrists. The Decemberists formed in 2000 when Colin Meloy left his band Tarkio in Montana and moved to Portland, Oregon. There he met Nate Query, who introduced Meloy to Jenny Conlee (they had played together in the band Calobo) and the three scored a silent film together. Playing a solo show prior to meeting Query, Meloy met Chris Funk. Funk was a fan of Tarkio and played pedal steel on the first two Decemberists releases, not "officially" becoming a member until the third effort. The band's first drummer, Ezra Holbrook, was replaced by Rachel Blumberg after Castaways and Cutouts, who in turn was replaced by John Moen after Picaresque. The band's name refers to the Decembrist revolt, an 1825 insurrection in Imperial Russia. Meloy has stated that the name is also meant to invoke the "drama and melancholy" of the month of December. 5 Songs, the band's debut extended play, was self-released in 2001. The members at that time played for several hours in a McMenamins hotel the night before to raise the money needed to record in the studio the next day. This originally served as a demo tape and the five songs on it (minus "Apology Song") were recorded in under two hours. After releasing its first full record, Castaways and Cutouts, on Hush Records, the group moved onto the Kill Rock Stars recording label. 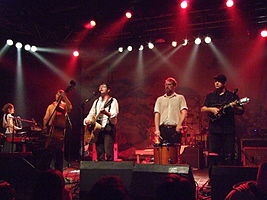 After the re-release of Castaways, Her Majesty the Decemberists was released in 2003. In 2004, the band released "The Tain," an eighteen-and-a-half minute single track based on the Irish mythological epic Táin Bó Cúailnge. The band's final album with Kill Rock Stars was Picaresque, which was recorded in a former church. In March 2005, the band distributed a music video via BitTorrent, the self-produced "16 Military Wives" (from Picaresque). In the same month, the band's equipment trailer was stolen; fans contributed to a replacement fund, and another fundraiser was organized via an eBay auction, with buyers bidding for copies of Colin Meloy Sings Morrissey and original artwork by Carson Ellis. The band also received help from Lee Kruger, the Shins, The Dandy Warhols, and other musicians. C.F. Martin & Company offered 6- and 12-string guitars on permanent loan. In early April, police discovered the trailer and a portion of the band's merchandise in Clackamas, Oregon, but the instruments and equipment were not recovered. On December 12, 2005, Meloy revealed to Pitchfork Media that the band had signed to Capitol Records, and planned to begin recording their major label debut with producers Tucker Martine and Chris Walla (of Death Cab for Cutie) in April 2006. The band's first album on Capitol, The Crane Wife, was released on October 3, 2006. The release was accompanied by an appearance the same day on Late Night with Conan O'Brien, during which the band performed "O Valencia!". The supporting tour (called "The Rout of the Patagons Tour") began on October 17, 2006, at Portland, Oregon's Crystal Ballroom. The opening act was Lavender Diamond. Later in the tour, Alasdair Roberts opened for the band. In 2006, The Crane Wife was voted NPR listeners' favorite album of the year, as announced on the December 5 episode of All Songs Considered, and it remains one of the Decemberists' most critically acclaimed records. In November 2006, the band encouraged fans to create a music video for the single "O Valencia!" using footage of the band in front of a green screen. On his Comedy Central program, Stephen Colbert started a mock feud with the band, claiming his "green screen challenge" came first; the band countered that its 2005 on-stage lightsaber fight in San Francisco preceded Colbert's idea. The feud culminated in a December 20 guitar solo competition on Colbert's show, with lead guitarist Funk representing the band. After Colbert feigned a hand injury, Peter Frampton took over for Colbert and won an audience vote. Show guests got involved, with New York Governor-elect Eliot Spitzer and Dr. Henry Kissinger declaring, "Tonight, I think the American people won." The prize for winning the challenge was revealed to be a copy of The Crane Wife. According to Meloy, the Colbert challenge was not scripted, though the band was told that Frampton would step in for Colbert. In July 2007, the band embarked on a five-date tour with a full orchestral accompaniment. On July 7, the tour put the band on the stage of the historic Hollywood Bowl for the first time, pairing them with the Los Angeles Philharmonic. On July 15, the band performed with The Mann Festival Orchestra at the Mann Center for the Performing Arts in Philadelphia, Pennsylvania, where they debuted a new song.On July 23 with the Atlanta Symphony Orchestra at the legendary Chastian Park Amphitheater in Atlanta, Georgia. The band then played a free concert in Chicago at the Millennium Park with the Grant Park Symphony Orchestra. On October 6, 2007, the band announced the cancellation of the remainder of their European tour, citing the ill health of a band member. On November 1, 2007, the band further canceled the remaining 28 shows of their "Long and Short of It" tour. The members of The Decemberists appeared, individually billed (as "Colin Meloy, Chris Funk, Jenny Conlee, Nate Query, and John Moen"), to perform in support of Democratic presidential candidate Barack Obama at a rally at the Tom McCall Waterfront Park in Portland, Oregon, on May 18, 2008. On October 14, 2008 the band began releasing a series of singles called Always the Bridesmaid; a volume was released every month until the end of the year. The band also took up a limited tour in support of the singles, including an appearance on Late Night with Conan O'Brien. The Hazards of Love was released on March 24, 2009 on Capitol Records, under Red Light Management (Jason Colton and Ron Laffitte). It was made available for download on iTunes one week earlier, on March 17, 2009. The track "The Rake's Song" was put up for download on The Decemberists website in advance of the album's release. During Meloy's 2008 U.S. tour, he played several new songs that were included on the album. The album was produced by Tucker Martine. In a post on Rolling Stone's "Rock 'n' Roll Daily" blog, the band revealed more details about the album. The original plan was for The Hazards of Love to be a staged musical. However, it seems that the story was "unstageable" in such a format. Instead the band played the entire album start to finish at each concert on the spring tour. A press release read: "The album began when Meloy – long fascinated by the British folk revival of the 1960s – found a copy of revered vocalist Anne Briggs's 1966 EP, titled The Hazards of Love. Since there was no actual song with the album’s title, he set out to write one, but was soon immersed in something much larger. The Hazards of Love tells the tale of a woman named Margaret; her shape-shifting lover, William; his fey forest queen mother; and a cold-blooded, lascivious rake, who recounts with spine-chilling ease how he came "to be living so easy and free" in "The Rake's Song". Lavender Diamond’s Becky Stark and My Brightest Diamond’s Shara Nova deliver the lead vocals for the female characters, while My Morning Jacket’s Jim James, Robyn Hitchcock and The Spinanes’ Rebecca Gates appear in supporting roles. The range of sounds reflects the characters’ arcs, from the accordion’s singsong lilt in “Isn’t it a Lovely Night?” to the heavy metal thunder of 'The Queen’s Rebuke/The Crossing.'" On February 9, 2009, the Decemberists announced in a newsletter to fans that they would be embarking on the first leg of the "A Short Fazed Hovel" Tour 2009 starting on May 19 in Los Angeles at the Hollywood Palladium. The newsletter included a complete list of dates for the first leg of the tour ending on June 14 at the Bonnaroo Music & Arts Festival in Manchester, Tennessee. On Monday April 27, the band performed a shortened version of "The Wanting Comes in Waves/Repaid" on The Colbert Report. On August 14, 2009, the Decemberists played in Pittsburgh, PA at the Benedum Center. During the show, the band members performed a skit where they ran up and down the aisles participating in a fictitious battle at Fort Pitt. On September 19, 2009, The Decemberists played a "lottery show", originally billed as a "by request" show, at Terminal 5 in New York City. The setlist was composed of songs drawn from a large bingo turner kept on stage. The master of ceremonies for the evening was singer/songwriter John Wesley Harding and the opening act was Laura Veirs and the Hall of Flames. The randomized setlist included "July, July! ", "Yankee Bayonet (I Will Be Home Then)", "The Tain I-V", "Annan Water", "The Crane Wife 3" and "The Island/Come and See/The Landlord's Daughter/You'll Not Feel the Drowning", and an original song, as a bingo ball suggested, called "Miracle on the Hudson". In 2009, The Decemberists also contributed the song "Sleepless" to the AIDS benefit album Dark Was the Night, which was produced by the Red Hot Organization. During their European tour in the winter of 2010, the band performed "The Mariner's Revenge Song" at the conclusion of each date. The audience was encouraged to scream as if they were being consumed by a whale mentioned in the track's narrative while the band pretended to die on stage. The Decemberists remained off tour as they embarked on a new studio album. On September 4, 2010, the band opened for Neko Case and the headliner, Bob Dylan, the first day of the Bumbershoot Arts and Music Festival in Seattle, WA. There, they announced that they were wrapping up recording of a new album and debuted three of its tracks. The King Is Dead was released on January 14, 2011, with Peter Buck of R.E.M. contributing instrumentation to three of its songs. Colin Meloy later affirmed that R.E.M. had been an inspiration during the writing and recording of some of the album's material. "Down by the Water," a track from the new album, was released via the band's official site on November 2, and was immediately available on iTunes as a free download. The song would later be nominated for Best Rock Song at the 54th Grammy Awards. The King Is Dead debuted at No. 1 on the Billboard 200 in the United States upon its release, the first time a Decemberists album would achieve this. As compared to the band's previous work, which was influenced by the music of the British folk revival, The King Is Dead was more influenced by traditionally American genres including country, blues, and Americana. The Decemberists' "Popes of Pendarvia World Tour" in support of The King Is Dead began with a show on January 25, 2011 at Beacon Theatre in New York City. The tour, which included engagements throughout the U.S., Canada, and Europe, ended on August 26 at the McMenamins Edgefield in Troutdale, Oregon. During the tour, on May 3, it was announced on The Decemberists' official site that Jenny Conlee had been diagnosed with breast cancer and would miss most of the band's remaining tour dates while receiving treatment and recovering. In support of their bandmate, the band designed a 'Team Jenny' charity t-shirt for the Yellow Bird Project to raise money for Planned Parenthood. Conlee would later make a full recovery after her cancer went into remission. Meanwhile, on April 7, 2011, the band released a music video for their song "This Is Why We Fight". Directed by Aaron Stewart-Ahn, the video depicts a band of teenagers living in a bleak, post-apocalyptic society. Disgusted with the tyrannical rule of their "king", one boy and one girl lead a splinter group away from the camp. Outraged, the king and his forces attack, but the video cuts to black before any resolution can be seen. In August, an eight-song set was released on iTunes featuring six previously released tracks and two new covers: Leonard Cohen's "Hey, That’s No Way To Say Goodbye" and the Fruit Bats' "When U Love Somebody". Later that month, a new music video was debuted for the track entitled "Calamity Song". The video depicts a game, played on a tennis court by children, of simulated thermonuclear war as described in the "Eschaton" scene of David Foster Wallace's novel Infinite Jest. Meloy announced during the "Popes of Pendarvia" tour that the group would take a multi-year hiatus once the touring cycle was over. To cap off this period of activity, the band released the follow-up outtake EP Long Live the King on November 1, 2011, as well as a live album from their tour for The King is Dead titled We All Raise Our Voices to the Air (Live Songs 04.11–08.11) on March 13, 2012. In addition, the band recorded a song for The Hunger Games soundtrack, called "One Engine". The soundtrack, The Hunger Games: Songs from District 12 and Beyond, was released on March 20, 2012. While on hiatus, the group's only activity as The Decemberists was a cameo appearance on the 7th episode in the 24th season of The Simpsons, in which the band was rendered in the show's traditional style of animation and presented as the hip, new music teachers of Springfield Elementary. As well, the episode's theme music was performed with the signature folk flair of The Decemberists. During a solo tour in 2013, Meloy announced that The Decemberists would end their hiatus and begin working on a new album within the next year. The hiatus officially concluded on March 5, 2014, with the announcement of two headlining shows at Portland's Crystal Ballroom, the band's first shows in three years, where they played their debut album, Castaways and Cutouts, in its entirety. On April 24, further establishing their return, the band performed on the Season 6 finale of the NBC comedy series Parks and Recreation. Additionally, The Decemberists were the mystery band for the 2014 Boston Calling Music Festival, where they played on Saturday, May 24. On November 3, 2014, "Make You Better", The Decemberists' first single off the new album, was released, and on January 20, 2015, the band's seventh studio album, What a Terrible World, What a Beautiful World, was released. To commemorate both the release of the new album and the Decemberists' success as a whole, January 20 was officially declared "Decemberists Day" in the group's hometown of Portland, Oregon, by mayor Charlie Hales. In support of the album, The Decemberists made late-night appearances on Jimmy Kimmel Live! and Conan, and on February 11, embarked on a European tour which included dates in Ireland, the UK, The Netherlands, Belgium, Switzerland, Germany, and Italy. A North American tour began on March 21, 2015, in the band's hometown of Portland, Oregon. On October 9, 2015, The Decemberists released a five-track EP compiled from leftover tracks recorded during the What a Terrible World, What a Beautiful World sessions entitled florasongs. A collaborative album titled The Queen of Hearts with UK folk artist Olivia Chaney was released under the name Offa Rex on Nonesuch Records on July 14, 2017. The album is composed mainly of versions of traditional and British folk revival songs from the 1970s. U.S. tour dates were announced for July and August 2017. In late 2017, the band contributed "Ben Franklin's Song", with lyrics by Hamilton creator Lin-Manuel Miranda, to Miranda's monthly "Hamildrops". On January 17, 2018, the band announced the new album I'll Be Your Girl, released on March 16th. The album is produced by John Congleton and was accompanied by a tour. On August 14th, the band's concert at Prospect Park Bandshell (part of the BRIC Celebrate Brooklyn Festival) was broadcast live on WFUV. Along with newer material, the band performed The Crane Wife in its entirety. On December 14 of that year, they released an EP, Traveling On. The group's songs range from upbeat pop to instrumentally lush ballads, and often employ instruments like the accordion, keyboards, and upright bass. In its lyrics, the band eschews the introspection common to modern rock, instead favoring a storytelling approach, as evidenced in songs such as "My Mother Was a Chinese Trapeze Artist" from the 5 Songs EP and "The Mariner's Revenge Song" on Picaresque. The band's songs convey tales ranging from whimsical ("The Sporting Life", "Apology Song") to epic ("The Tain") to dark ("Odalisque", "The Rake's Song") to political ("16 Military Wives", "Valerie Plame"), and often invoke historical events and themes from around the world ("Yankee Bayonet", "Shankill Butchers"). On their website, the group claim that their official drink is Orangina, that they love the video game BioShock and "adore" the bands Norfolk & Western, Explosions In The Sky, The Postal Service, The Long Winters, Death Cab for Cutie, Dokken, Tycho, El Ten Eleven, The Shins, The Octopus Project, Electrelane, Camera Obscura, Clearlake, The Thermals, Modest Mouse, Swords and Earlimart. The band's official biography, keeping up their reputation for grandiloquence, also describes how they met in a Turkish bath. A footnote following the biography claims, "The Decemberists travel exclusively by Dr. Herring's Brand Dirigible Balloons." Colin Meloy has listed Anne Briggs, Nic Jones, and Shirley Collins – who led the 1960s British folk revival – as major influences on The Hazards of Love. Meloy has also confessed a "slavish love" for Morrissey, one of his principal influences to whom he has a tattoo dedicated, and has made "a sort of pilgrimage" to the site of the cover photograph for The Waterboys' Fisherman's Blues, an album he wore "out from obsessively repeated listens." The band has also cited their liking for Siouxsie and the Banshees, and the pop tunes of R.E.M. and XTC. The band also draws inspiration from British and Irish folk music. ^ a b Brian Wise (2007-06-24). "Segue From 'Gigi' to Geek-Chic Rock". The New York Times. Retrieved 2008-02-03. ^ Classen, Allen (7 May 2014). "Gasco Building lovers gear up to save 'industrial cathedral'". NW Examiner. Retrieved 1 October 2018. ^ Gene Armstrong (June 17, 2004). "On Behalf of Orangina: The Decemberists perform their dramatic, literary alt-rock, with orangina soda in tow". Tucson Weekly. Retrieved 2006-10-10. ^ "Rockers Flex BitTorrent's Muscle". Wired News. March 23, 2005. Archived from the original on November 9, 2006. ^ "Decemberists Shipwrecked By Pirates". CMJ. 22 March 2005. Archived from the original on 4 April 2005. ^ Exclusive: The Decemberists Sign to Capitol Records. Archived 2007-10-26 at the Wayback Machine Pitchfork. Retrieved on November 6, 2007. ^ Boutet, Chris. "The Decemberists Tell Tales of Heart • Interviews •". Exclaim.ca. Archived from the original on 2012-07-09. Retrieved 2012-03-18. ^ "All Songs Considered". NPR. Retrieved 2011-07-20. ^ Maher, Dave (2006-11-30). "Video: Stephen Colbert Vs. The Decemberists". Pitchfork Media. Archived from the original on 2007-10-24. Retrieved 2007-06-28. ^ a b Matthew, Solarski (2006-11-30). "Exclusive: Decemberists Counterchallenge Colbert!!". Pitchfork Media. Archived from the original on 2007-10-24. Retrieved 2007-06-28. ^ "Colin Meloy of The Decemberists". National Public Radio. 2007-01-29. Retrieved 2007-06-28. ^ Peters, Mitchell (2007-04-20). "Decemberists Get Orchestra Treatment On Tour". Billboard.com. Retrieved 2007-06-28. ^ Decemberists at the Mann Center in Philadelphia- New Song. YouTube. Retrieved November 6, 2007. ^ "The Hazards of Love (The Decemberists, cover art) at Decemberists.com" (PDF). Capitol Records. 2009. ^ Austin L. Ray (2009-04-06). "Decemberists' Colin Meloy talks Hazards of Love :: Music :: News :: Paste". Pastemagazine.com. Retrieved 2011-07-20. ^ Rolling Stone (2008-11-18). "In the Studio: The Decemberists Return With Fairy-Tale Album | Rolling Stone Music". Rollingstone.com. Retrieved 2011-07-20. ^ "Decemberists playing 'By Lottery' in NYC & other new dates". Brooklynvegan.com. 2009-08-19. Retrieved 2011-07-20. ^ "The Decemberists Lottery Show w/ Laura Veirs – September 21, 2009 – New York, NY". Rockscope. Archived from the original on October 6, 2011. Retrieved 2011-07-20. ^ "The Decemberists & Laura Veirs w/ lotto master John Wesley Harding @ Terminal 5 in NYC – pics & setlist". Brooklynvegan.com. 2009-09-23. Retrieved 2011-07-20. ^ "The Decemberists Concert Setlist at Terminal 5, New York on September 19, 2009". setlist.fm. Retrieved 2011-07-20. ^ Thurm, Eric. "Watch Colin Meloy, Ben Gibbard, and Peter Buck Perform R.E.M. 's "You Are The Everything"". The A.V. Club. Retrieved 26 February 2013. ^ "The Decemberists Reveal 2011 Tour, Play Montreal, Toronto". ^ "tour-archive". Decemberists. Retrieved 2012-03-18. ^ "A Note from Colin and Jenny". Decemberists. 2011-08-06. Retrieved 2012-03-18. ^ "Jenny Conlee Diagnosed With Breast Cancer". ^ "Decemberists keyboardist Jenny Conlee diagnosed with breast cancer". ^ "Yellow Bird Project – Team Jenny Tees". Decemberists. Retrieved 2014-02-11. ^ "First Watch: The Decemberists, 'Calamity Song'". ^ "The Decemberists Announce First Headlining Concert in 3 Years – Rolling Stone". Rolling Stone. Retrieved 14 January 2015. ^ "The Decemberists Returning for Benefit Show". Billboard. Retrieved 14 January 2015. ^ "The Decemberists are also going to be on Parks And Recreation". Avclub.com. Retrieved 14 January 2015. ^ "Home – Boston Calling Music Festival". Boston Calling Music Festival. Retrieved 14 January 2015. ^ "Spotify". Play.spotify.com. Retrieved 14 January 2015. ^ ": New beautiful record out in January!". Carsonellis.com. Archived from the original on 1 January 2015. Retrieved 14 January 2015. ^ ""Make You Better" (Trailer) – The Decemberists". Decemberists.com. Retrieved 14 January 2015. ^ "January 20 named Decemberists day in Portland; free show at City Hall". The Oregonian. Retrieved February 18, 2015. ^ "The Decemberists: Tour Dates". Decemberists.com. Retrieved April 7, 2015. ^ "New EP, florasongs, Coming October 9th". Decemberists.com. Retrieved July 7, 2016. ^ "New Album Coming in March, World* Tour Announced – The Decemberists". www.decemberists.com. Retrieved 2018-05-18. ^ "The Decemberists: BRIC Celebrate Brooklyn 2018 | WFUV". www.wfuv.org. Retrieved 2019-01-17. ^ "The Decemberists played 'The Crane Wife' in full for Celebrate Brooklyn! finale (pics, setlist, video)". BrooklynVegan. Retrieved 2019-01-17. ^ An interview of Mike Scott by Colin Meloy in The Believer, September 2007. ^ "Pitchforkmedia, interview by Brian Howe, posted October 30, 2006". Pitchfork.com. 2006-10-30. Retrieved 2011-07-20. Wikimedia Commons has media related to The Decemberists.